Back in the dark days of January, when I was still in the rehabilitation hospital in Maryland, Fluffy would often go for walks to reduce his stress and bring a little sunshine into his day. He would always take his cell phone with him, just so that he could be reached by the hospital, by the insurance company, or by his manager. When he came across something interesting in his walk, he would often take a picture with his phone, and then share it with me when he came to visit that day. We live next to an area that is so crisscrossed with streambeds that it will never be developed (thank goodness! ), so it is only a 10-minute walk from our house until you feel like you are in the forest. In the summer, when the leaves are on the trees, you would never even know that you were close to civilization. Notice the sign that is attached to the middle of the tree. It says “District of …,” at the top and then, lower down and in bigger letters, “GOVERNMENT ROADWAY.” Just to show the fear that this sign engendered to those who passed by, the sign is adorned with a number of bullet holes. There is nothing usual about the sign itself. 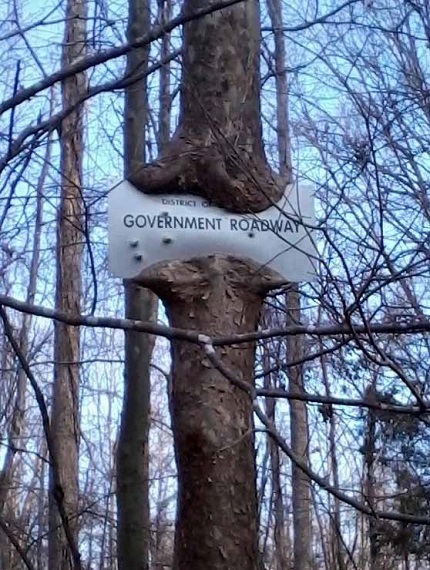 What is amazing is the way that the tree has grown around the sign, trying to adapt itself to live with the parasite that is attached to its trunk. I’m not sure how long the sign has been here. Even now the tree has grown over the top and bottom of the sign, to the point where it is almost touching itself. How much longer will it be until the sign is completely obscured? Then it will be an even more unusual sight, looking like a large, rectangular blister in the center of the tree. I have thought about this picture several times, and it always reminds me of the ways that things attach themselves to us. Sometimes they attach themselves without our even being aware of them, and sometimes we invite them into our lives. One day we may wake up and find that something that was once an invited guest is now a bother and a burden. We had a friend who was never very excited about being active in our church. One day she told us that when she was younger her mother, who was a long-time Relief Society President, had been so busy serving others that she didn’t have time to serve her own family. Our friend had vowed never to get that involved. We had to agree with her on some level, and realized that even good things can be bad when used to excess. Do we have any signs attached to us that have outlived their usefulness? If so, perhaps it’s time to get rid of them and start the healing process.